Alex Sez: Pocket Eyes are awesome. Use them all the time. Lifesavers at the restaurant! Reading glasses that you carry on your keychain? Really! 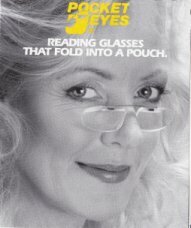 Never be without your reading glasses again. Pocket Eyes are very small foldable readers that you carry on your keychain in a protective, yet easy to open pouch. This is Alex, the president of Strictly USA. I can't tell you how many times I have been out and about, shopping, dining out or running other errands when I find myself needing some reading glasses. It can be a menu, a form to fill out, a magazine or scanning a package label. And many times I don't have my regular glasses. Pocket Eyes to the rescue! Clear vision is as close as my car keys. Put on the pocket eyes and I can read anything! They're lifesavers. They are always there at the ready. 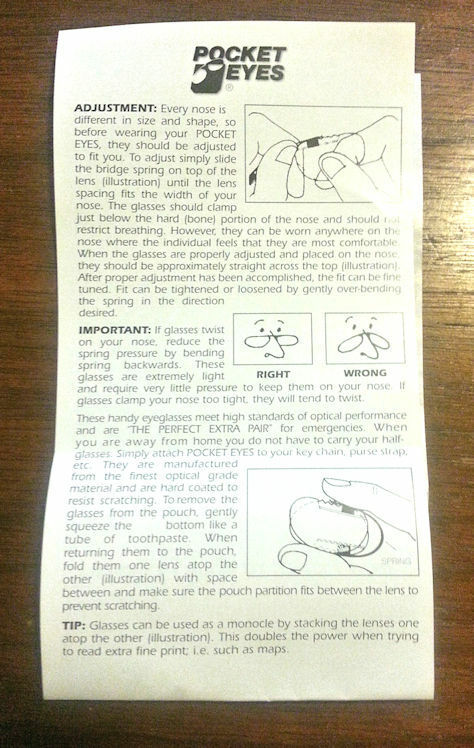 Use Pocket Eyes for all those occasions when you suddenly need your reading glasses. PERFECT for Restaurants, Travel, Grocery Shopping, Bookstore or even waiting rooms. Pocket Eyes are indispensable when you need to read something in a pinch. Fully Adjustable. The stainless steel center piece can be slid into the lens notches to create a comfortable setting for just about any size nose. PRO TIP: Buy multiple Pocket Eyes so you can have one on all of your keychains. I have a set of car keys and a set of keys for my scooter. Pocket Eyes are attached to each! NOTES: On some Pocket Eyes the stainless steel center piece is a bit stiff at first so exercise caution when adjusting. Try prying up slightly the ends of the nose piece that rides in the notches. That can help bring the lenses closer together. To bring the lenses further apart, hold one lens in your hand with thumb on the top of the nose piece and 2nd finger between the lenses. With my other hand, pull the other lens around your 2nd finger which forces it to open up. Then reverse the lenses and open up the other side. I bought these to carry with me (e.g., on a key chain) to use when my regular reading glasses aren't at hand, like reading a menu in a restaurant. For such short-duration uses they fill the bill nicely. Their main positive attribute is that they fit into the very small pouch provided with the glasses. In my view they wouldn't work well for an extended period.